This is a cake I’ve been making since I was about ten years old. It’s a family favourite. My omi requests it whenever rhubarb is in season, my great-grandmother made it often, and my mom taught me when I was little. She used to ask me to sprinkle the streusel on the cake and I would sneak bits of it every time, and then steal whichever bits I thought wouldn’t be missed while the cake was cooling on the counter. I love streusel so much that I used to mix little bowls of it to eat plain after school sometimes, hah. If you’re not sure what it is, it’s just another word for the crumble topping (Rhabarber Streuselkuchen in German). 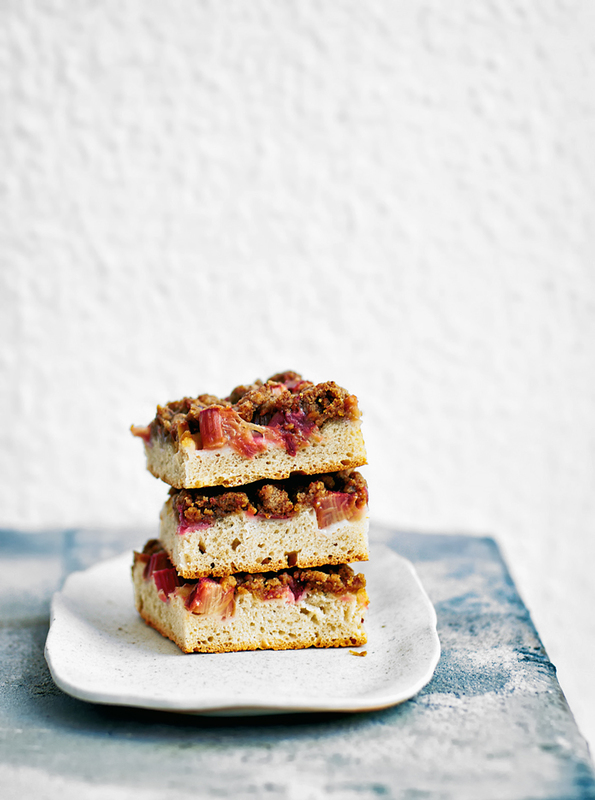 Rhubarb streusel cake is very popular in Germany in the springtime and I’ve always made it with the first rhubarb from our garden. This year I had to buy rhubarb, which made me irrationally grouchy, but it’s still a treat to use some of the first fresh produce of the season. Forced rhubarb is beautiful here. If you don’t like rhubarb, you heathen, the base recipe can be used with any number of fruits. Apple, plum – as in this recipe from my friend Sophie – and berries are all great options, but you can use almost any fruit. 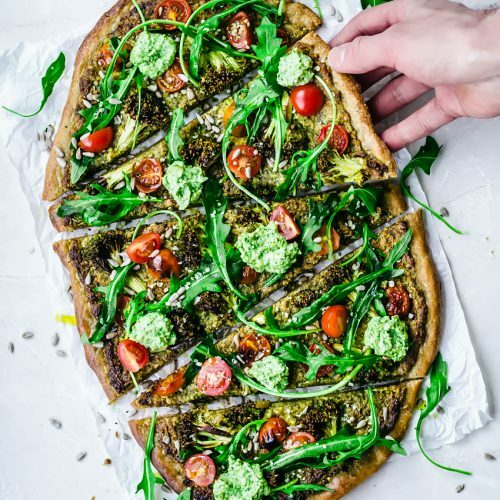 This is a healthier vegan version of the traditional German recipe made with whole food ingredients like spelt flour, coconut oil, and coconut sugar. The base is a yeasted dough. 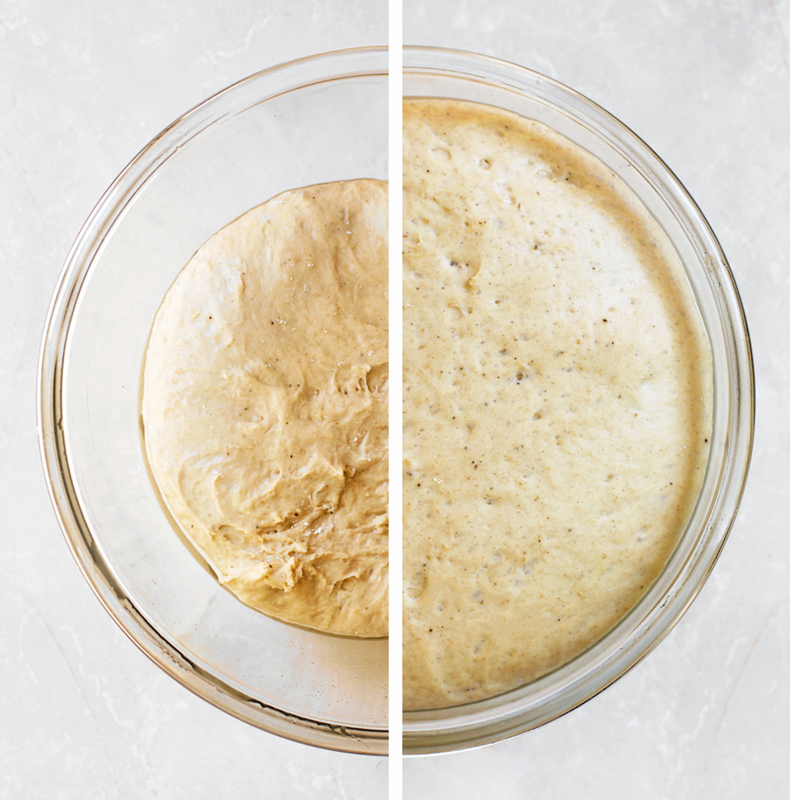 If you’re a little worried about working with yeast, just try it! I encourage you to try with a sweet bread like this first, as I find them generally easier to work with than other breads (the dough is a little more forgiving in my opinion) and you don’t have to worry about shaping it. If you’re into bread, check out my bread recipe archives – lots of good stuff in there! The dough is mixed, kneaded, and then after it rises you just press it down with your hands into the sheet pan instead of rolling. If you have a stand mixer you can use it to knead the dough. If you’re doing it by hand, like I did, it’ll take about ten minutes of active kneading time. I used fresh yeast for this particular cake because it’s more common here, but I’ve made it with dry yeast in the past with no issues. The cake is huge so either plan to eat a lot of cake yourself, bring it to a party, or invite some friends over for Kaffee und Kuchen and share (my omi came over and ate five pieces). It fills a standard German baking sheet which is a bit larger than Canadian/American ones, but you can just use your biggest baking sheet and have a slightly thicker cake. It’s best on the day it’s made, but not bad on day two – the streusel tends to get a little soft after it’s been sitting. 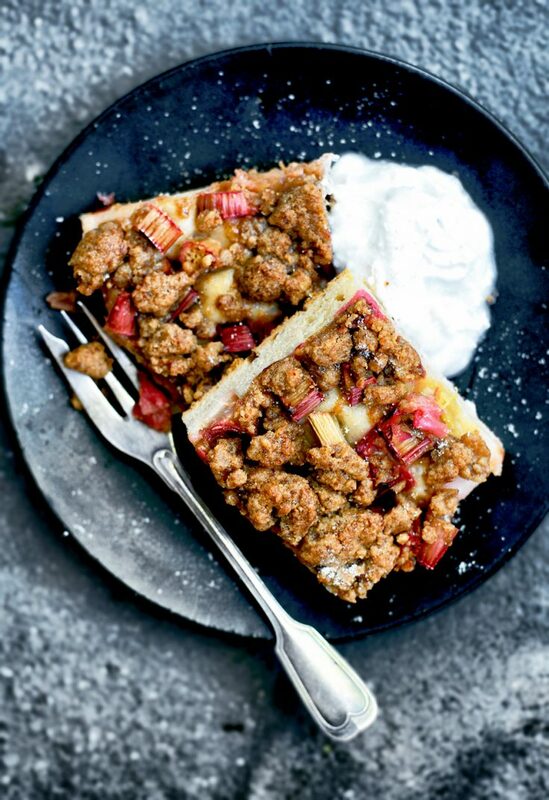 And remember that this is pretty much bread and fruit, so it’s perfectly acceptable to eat a little rhubarb crumble cake for breakfast. I’ve included a whole paragraph of tips at the bottom of the post, so if you’re new to this type of recipe, I recommend reading them before starting. It seems like a very long, involved recipe, but there’s not very much active time – I just wanted to give plenty of instruction so that the recipe turns out well for everyone. 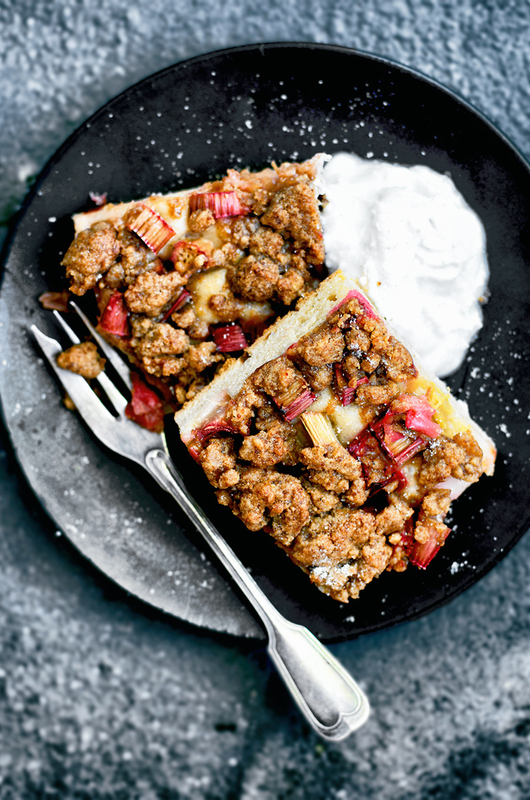 This vegan rhubarb streusel cake is a healthier twist on the German classic, made with coconut sugar, coconut oil, and a soft spelt base. Place the milk, maple syrup, and coconut oil to a small saucepan and heat on low until the coconut oil is melted and the mixture is just warm to the touch. Pour this mixture into a large mixing bowl and crumble/sprinkle the yeast over it. Let this sit for 15 minutes, or until it is bubbling or foaming, before adding the remaining ingredients. Add 1 cup of flour, along with the vanilla, salt, and cardamom to the mixing bowl and stir to combine. Stir in another 1 cup of flour, then start adding it in 1/2 cup increments, stirring to fully incorporate between each addition. Once it becomes too difficult to stir, generously flour a large surface (your countertop) and turn the dough out to knead it. Knead for about 10 minutes, adding more flour as necessary, until a smooth, soft dough forms. Grease a large mixing bowl and place the finished dough in it to rise. Cover the bowl with a tea towel and place it in a warm place, like your oven with the light on, for about an hour, or until the dough has doubled in size. Preheat your oven to 180C / 350F and line a large baking sheet (or two smaller ones) with parchment paper. Gently punch the dough down and then place it onto the prepared baking sheet. Use your hands to press the dough into the pan, going from the centre to the edges, until it is about the same thickness throughout. 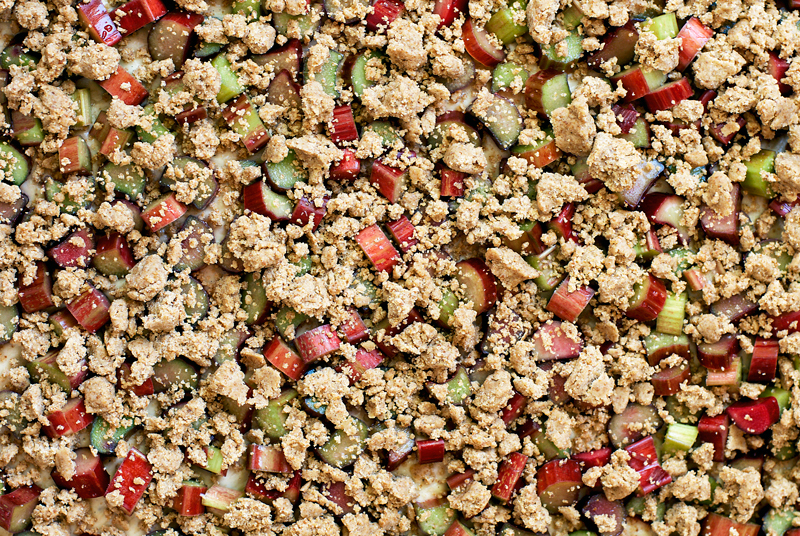 Cover this with a tea towel again to rise slightly while you cut the rhubarb and prepare the streusel. 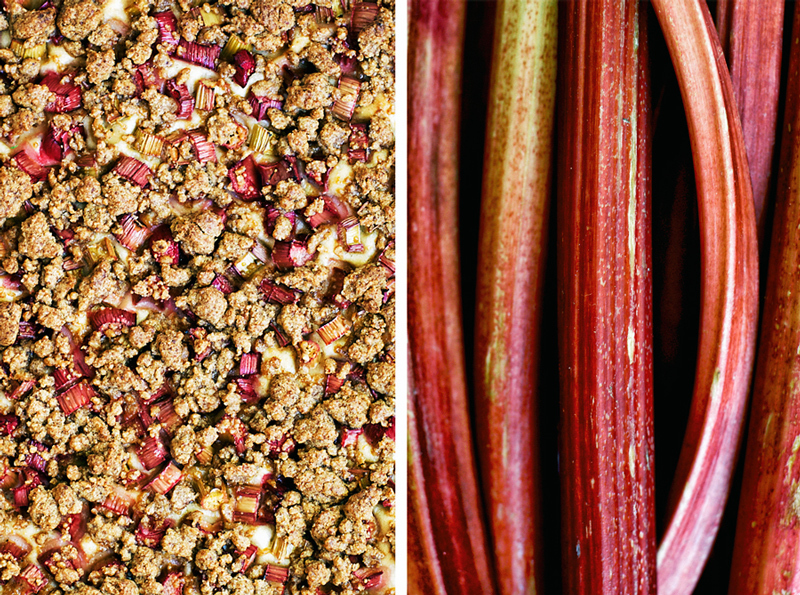 Add the rhubarb in an even layer over the cake, then top with the streusel, going right into the corners. Bake for 35-40 minutes, or until the edges of the cake are golden. Remove from the oven and let it cool before serving. 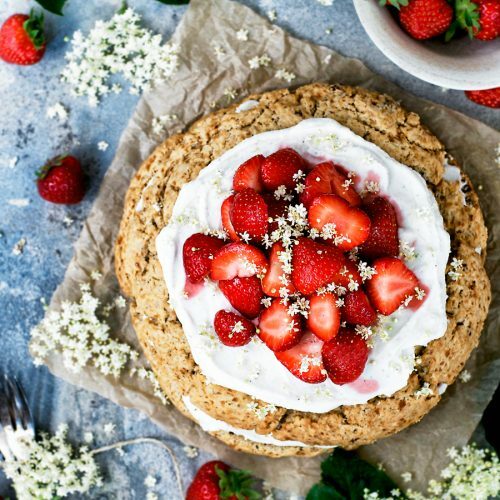 Serve with coconut whipped cream or yogurt. Coarsely chop the rhubarb and place it into a bowl with the lemon juice and maple syrup. 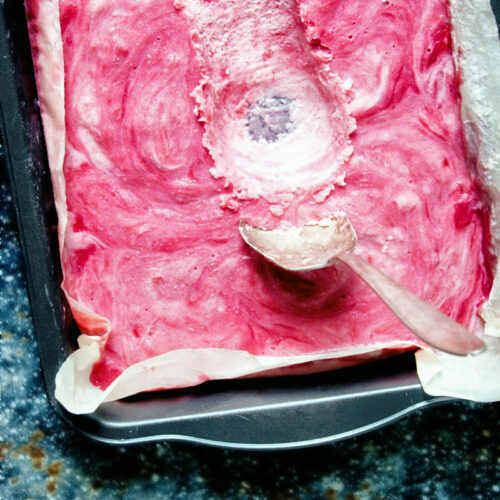 Use your hands or a wooden spoon to coat the fruit, then add it to the cake. 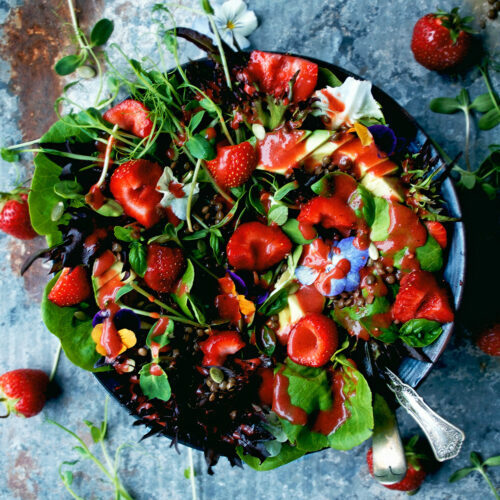 Add all of the ingredients to a bowl and use your hands to squeeze the ingredients together until a crumbly mixture forms. Sprinkle over the rhubarb onto the cake in an even or chunky layer. • If your milk mixture gets too warm, pour it into the bowl and let it cool before adding the yeast. If it's too hot it will kill the yeast. • If you mix your yeast into the liquids and it doesn't bubble, your yeast is dead and you probably need to buy a new pack. • The amount of flour is given as a range because it depends on the humidity of you home. The end goal is a soft dough that just barely sticks to your hands, so add the amount of flour needed for that. • It took my dough 2 hours to rise fully. Make sure you give it enough time, but it might not need a full 2 hours depending on how warm your kitchen is. • Don't worry if the dough is slightly uneven when you press it into the pan, it won't really make a difference in the finished product. Try to avoid extreme differences in thickness. • I like my streusel to be a little chunky. If you prefer a more even, lighter crumble, just make the pieces smaller than I did when you add them to the cake. 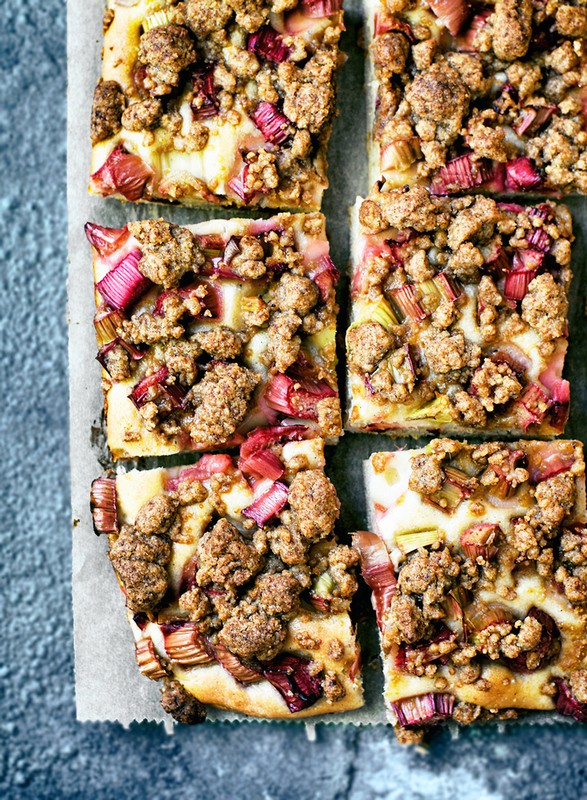 • There's no need to peel the rhubarb for this recipe. Adding a tiny bit of lemon and sweetener isn't completely necessary, but really improves the taste of the fruit. • Your streusel might be a little more or less crumbly depending on your flour, how dry your sugar is, and the humidity. If it's too wet, it usually needs more flour. If it's holding together but not really crumbling, add more sugar. If it's too dry then sparingly add more oil. Add small amounts until you get the consistency you want. * My coconut oil was fairly soft. If yours is very hard, using your hands to mix the streusel will heat the oil slightly and make it easier to incorporate. ** If you choose to use a different fruit, still add the lemon juice and maple syrup. I rarely use yeast in my baking, but this looks so pretty! I can almost taste it. Such a great tradition to have and share with others! My German grand-mother never made this. haha I wish she had! This sounds completely delightful, Alexandra! The yeasted dough as a base looks and sounds wonderful and such a perfect vehicle for the rhubarb streusel. That first photo is stunning! This cake looks fantastic – what a great blend of flavours & textures!